To use Pipeline Referencing, you must have your data in the required information model in the geodatabase. Pipeline Referencing has an information model for linear referencing system (LRS) networks (routes) and a flexible information model for LRS events that allow you to model your own event feature classes. Pipeline Referencing provides the ability to edit and maintain LRS networks and associated event data. It also supports updating event measures and route associations based on changes to the LRS network. Esri also provides a data model called the Utility and Pipeline Data Model (UPDM), with predefined feature classes for events and features in the pipeline network. UPDM bases its linear referencing and event model on the information model used by Pipeline Referencing. With Pipeline Referencing, you have the flexibility to define your own event data model or use UPDM. With UPDM, you can get up and running with Pipeline Referencing much faster because there is a geoprocessing tool to expedite data configuration called Create UPDM Geodatabase. Before using Pipeline Referencing tools, it is recommended that you read the information on the basic concepts behind the LRS network and LRS events information model. These concepts will not only aid in the understanding of data loading, but will also set the foundation for how to use the tools. 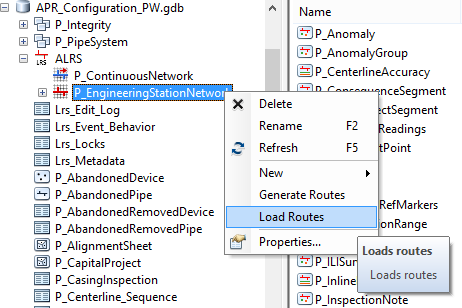 The modeling, creation, and configuration of the LRS, networks, and events, including event loading, are completed using geoprocessing within ArcGIS Pro. Route loading is completed within ArcMap or ArcCatalog. If you want to load your data into UPDM, use the Create UPDM Geodatabase tool in the Location Referencing toolbox to create the geodatabase and preconfigure it for use with Pipeline Referencing. You can create a UPDM geodatabase as a file geodatabase and load all the required data. Once the data is loaded, you can migrate your advanced linear referencing system (ALRS) to an enterprise geodatabase. For more information, see Migrating an ALRS from a file geodatabase to a multiuser geodatabase. To load events, you will need to use the Append Events tool. With this tool, both event tables and event feature classes can be loaded. If you want to model your own ALRS geodatabase and not use the Create UPDM Geodatabase tool, you can go through the following process to model your own Pipeline Referencing-compatible model. Note that this is an involved process and recommended only for advanced persons. Load events with the Append Events tool. To edit LRS networks, you must use the Location Referencing tab that is part of Pipeline Referencing for ArcGIS Pro. This tab supports editing the Pipeline Referencing information model elements used to build an LRS network. With it, you can create, realign, reassign, retire, extend, and cartographically realign routes. You can also edit calibration points and centerlines. You can't edit LRS route directions, but you can use these tools to apply edits to the LRS routes. To create, extend, or realign a route, you must use the Choose Centerline tool to select the centerlines that participate in the operation. The Location Referencing tab is context based; it will be visible only when you have Pipeline Referencing features for route editing (that is, routes, calibration points, and centerlines) added to your 2D map. Pipeline Referencing features (that is, routes, events, calibration points, and intersections) are modeled to support time (they are time aware). If you are configuring maps for editing networks, it is recommended that you configure time support for each of these layers in the map. Pipeline Referencing supports event editing via a web app called Event Editor. This web app is powered by Pipeline Referencing for Server. Route search—Locates routes on the map. Attribute set—Defines groups of event layers, named attribute sets, to provide attributes across multiple event layers in a single transaction for a given route and to and from measure pairs. The event layers can also be stored and referenced in different linear referencing methods (LRMs). Event Editor provides route and measure translations across LRMs. Quality control checks—Runs quality control checks for a route to detect event data gaps, overlaps, and invalid measures. Event Editor then uses its editing capabilities to correct those errors. Event data query and editing—Queries for event data by route association, ad-hoc queries, spatial intersecting geometry, or location proximity. You can visualize, browse, and bulk edit the tabular results. Install Pipeline Referencing for Server. Deploy your ALRS geodatabase to an enterprise geodatabase. 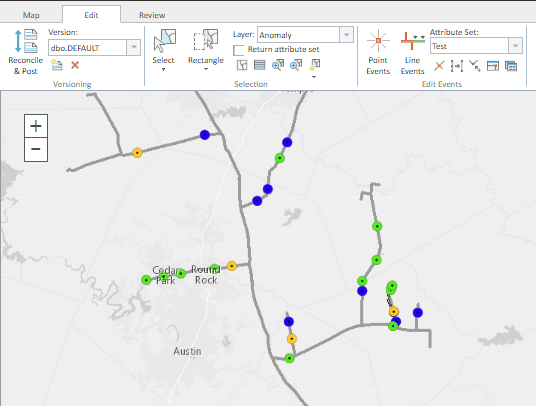 Publish a map service that contains the event layers to edit via ArcGIS Server (enabling the Pipeline Referencing for Server linear referencing capability). Configure the Event Editor configuration files: config.json and webmap.json. Pipeline Referencing includes a suite of geoprocessing tools that support LRS loading, processing, and data transformations. The geoprocessing tools provided primarily operate against event feature classes, whereas the geoprocessing tools provided by the Linear Referencing toolbox in ArcGIS Pro primarily operate against event tables. Pipeline Referencing provides QC checks for event data and the Event Editor web app. This allows your organization to continuously improve data quality and refine its pipeline data assets. In addition to these QC tools, you can also use ArcGIS Data Reviewer for Desktop, which is a feature set that extends the ArcGIS platform for checking data and managing data errors. Pipeline Referencing for Desktop includes Data Reviewer. For more information on Data Reviewer for Desktop, see What is Data Reviewer? Pipeline Referencing for Desktop includes ArcGIS Workflow Manager, which can be used to orchestrate data management in GIS and across business units to develop a standard, repeatable process for LRS data management within your organization. For more information on ArcGIS Workflow Manager, see What is Workflow Manager?